For once caught out and he was slow to react and come out to clear the danger as Palace got a soft opener. Otherwise looked assured with good distribution. Could do nothing about Palace's free kick that clanged off the crossbar just before half time or for Schlupp's goal. Blessed with a wise old footballing head, Pablo looked solid in defence throughout and added to the forwards momentum with some ambitious runs in the second half. Was unlucky not to score with a deflected scorcher early in the second half. Booked in the first half for a 'necessary' challenge on a marauding Andros Townsend and came close to a second yellow just before half time for a crude lunge on the edge of the Hammers box. Otherwise, was solid and dominant, as usual! Solid throughout with plenty of sound decision making and a determination to pass out from the back. 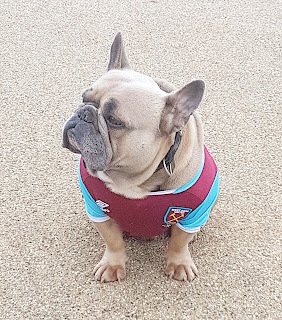 Looks to have a great Hammers career ahead of him. Looked a bit shaky for the first 20 minutes as things were just not going his way. Might have done better to clear the ball for Palace's opener. Grew into his role as the game progressed and had a fine second half opening up space on the left and whipping in a fine cross that Chicharito should have converted late on. Arthur is a player of extremes! Outstanding once again. You constantly have to wonder how a 19 year old can look so assured in the holding midfield role? Numerous important tackles and always in the action when needed. He plays like a young Bryan Robson or even Roy Keane depending on which country you think he will ultimately opt for! Another big performance from Captain Claret. Might have done better from a few good attacking positions in the first half but keeps us ticking over and makes sure that heads don't drop when things go against us. What a rehabilitation for a player who bacame an outcast last season. Looked like the player we paid £10 million to Hull for three years ago as he zipped about the pitch and created numerous chances. He will be delightwd to have scored the goal that turned the tide with a classy curling finish just after half time. Our MOTM. A constant threat throughout with jis nimble footed play tjat creates opening after opening. Topped a cracking performance off with a stunning goal on 65 minutes that looped over Hennessy and will surely win him goal of the month for the Hammers in December? He is now our top scorer this season with six goals to his name. In and out of the action in the first half but largely ineffective and will have fallen back down the pecking order after Carroll's impact. Harsh to be substituted so early but Pelle is ruthless and the change worked. Looked lively throughout if caught (? unfairly) for two offsides early on when we looked to be building momentum. Looked very comfortable alongside Big Andy in the second half and picked up a trademark poachers goal as Hennessy spilled Anderson's rasping free kick. Almost bagged a second from Masuaku's excellent cross soon after that. A good days work! Created a palpable sense of fear in the Palace derfence and won the free kick that led to Hernandez's goal. Adds plenty of muscle when defending set pieces as well. Great to see him back in action. Brings a frisson of excitement to proceedings but we were reminded of the naivity of youth as he lost Schlupp to allow Palace's second goal. He will learn! A solid 10 minutes as he helped us see the game out.